G4 PREMIERES NEW MARVEL ORIGINAL ANIME SERIES “X-MEN” ON FRIDAY OCTOBER 21ST!!! LOS ANGELES – September 14, 2011 – This summer, G4 and Marvel teamed up to bring legions of fans their favorite Super Heroes with the original Marvel anime series, “Iron Man” and “Wolverine.” Next up, Marvel’s most popular team of mutants will tear up the small screen when G4 premieres 12 half-hour weekly episodes of the new original anime series “X-Men” this fall, bringing even more action, drama, and high energy anime heroics. Featuring the voice of actor Scott Porter (“The Good Wife,” “Friday Night Lights,” “Caprica”) as Cyclops, “X-Men” premieres Friday October 21st at 11pm ET/PT. 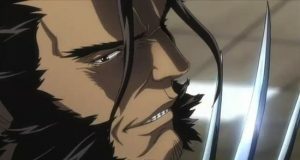 The fourth anime series as part of G4 and Marvel’s exclusive partnership, “Blade,” will premiere this winter. Actor Scott Porter takes on the title role in “X-Men” as the voice of Cyclops, the optic-force blasting deputy leader of the team. In the series, the X-MEN are reunited following the death of a teammate, and are summoned by Charles Xavier to track down Hisako Ichiki, a missing teenage girl in Northern Japan. There, they encounter the fanatical and anti-mutant group, U-MEN, and discover what was important enough for Xavier to bring them back together. The answer is something that could potentially bridge the gap between mutants and humans, or tear the two species apart forever. Nebraska native Scott Porter first appeared in the off-Broadway production of the musical “Altar Boyz.” He went on to portray wheelchair-bound Jason Street on the popular NBC series, “Friday Night Lights.” In 2008, Porter was featured in Andy and Larry Wachowski’s live-action “Speed Racer” film as Rex Racer. He also was the male lead in the film “Prom Night,” opposite Brittany Snow. He recently had a supporting role on CBS drama, “The Good Wife,” and can be seen in the upcoming CW series, “Hart of Dixie” this fall. This entry was posted on Thursday, September 15th, 2011 at 10:11 am	and is filed under News. You can follow any responses to this entry through the RSS 2.0 feed. You can skip to the end and leave a response. Pinging is currently not allowed. « Find Out Who Guests on the Return of Bill Maher This Week On HBO!! !